The World of Tomorrow by Brendan Mathews. Little, Brown and Company. Hardcover. 560 pages. The World of Tomorrow was an absolute breath of fresh air and I had such a fantastic time reading it. This book centers on three brothers during a brief period of time in 1939 New York. Though the events of the book only cover about a week of time, Brendan Mathews covers an extraordinarily vast and intricate amount of history, personality, and conflict throughout his telling of these events. There is something so extraordinarily clever and unique about this book, but I can't quite place it. There's a heavy emphasis on family and loyalty, but also on independence and learning to live in the best way possible. Family, however, is always at the heart of this story. Mathews writes with a quick mind in a manner that drags you into the story and the lives of each character. Speaking of characters, there is a actually decent-sized cast of characters, but I personally didn't find there to be too many characters, as I've heard others mention. The three brothers - Francis, Martin, and Michael - are the central figures of this narrative, but is a small abundance of others as well. There were a few very minor characters that I didn't feel needed to have their own chapters, but it hardly detracted that much from the story. I really did enjoy getting to know this rather disjointed (dare I say dysfunctional?) family. Quick-witted, trouble-making Francis is a true adventurer and also a joy to follow throughout the story, Michael is troubled and dealing with his own personal internal struggles, and then there is Martin, who is in a stable relationship with a wife and child in New York City. We also have Tom Cronin, the man sent to assassinate one of them, and a character that I found myself quite fascinated by. Each character was also treated with extreme care by Mathews. They were wonderfully fleshed out and created with unique personalities and characteristics. He also provides a rather length backstory for each character - this become slightly tedious at times, but I do believe that you could probably skim over it if that isn't your thing. I think Mathews writing was so lovely that I didn't want to skip over it, but it is something I would understand others doing. It's the writing style, however, that truly stands out with this book, as the way in which Mathews crafts the thoughts and actions of each brother allows us to experience everything that they are struggling with and to be sucked into their own complicated story. 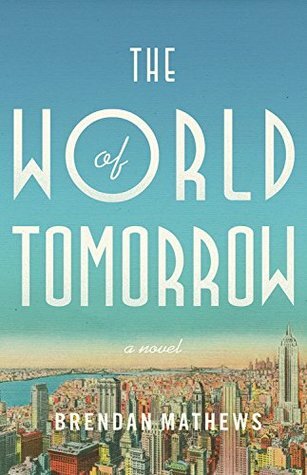 Overall, I really enjoy The World of Tomorrow and I would wholeheartedly recommend it to anyone looking for a well-written, family-centered story of intrigue and adventure. Four-and-a-half stars from me!